Crawfish Étouffée (a/k/a Smothered Crawfish) is a south Louisiana favorite during crawfish season. This is the ultimate Crawfish Étouffée recipe and very simple to make. Sauté vegetables and seasonings in butter for approximately 5 minutes. Add crawfish tails and cook on medium heat for one-half hour. Serve over cooked long grain rice. Serves 4. Just found this site Jacques, can't wait to try some of your recipes. My question here is a simple one: I'm not all that fond of crawfish. So can I assume that this Etouffee can be made the same way with other meats like shrimp? Yes! 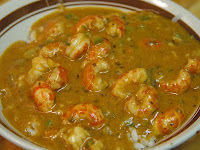 And, you can find a great "shrimp etouffee" recipe on this website. Search our index. Thanks. am I missing something in the recipe? the picture looks like some good stuff and it looks like it has plenty of sauce but the only liquid I see in the recipe is a stick of butter...are we to add ruex to this or something? Do not add water or any other liquid. The reason is because there is enough liquid in the vegetables and crawfish tails to get the job done right. Thanks for the comment on the pic. The meal was made right here in my kitchen. Can you make this recipe ahead of time, freeze and heat it up when you are ready to serve? I'm planning on catering my wedding with a cajun buffet but I need to find recipes I can make in advance and in large batches. If prefer to cook all of my food instead of buying prepackaged if possible. Yes and No. Yes, if you don't mind a tiny drop in quality because after freezing some of the ingredients in the recipe, (namely the crawfish), it will come out slightly watery and delicate and will tend to break apart when you defrost it--losing some of it firmness. If you are going to freeze it for later use, it would be better to let it thaw-out in the refrig then slowly warm it up again, mixing very gently as you do. That said, there's nothing like a right-out-of-the-pot piping hot Crawfish Étouffée. Good luck with your decision. This is the recipe my daughter uses and it always comes out GREAT! Gonna try to make it tomorrow evening for my 100% cajun BF!! !